Dubai Chamber of Commerce and Industry honors Al Nahda International FZCO during the exclusive ‘Exporter of the Month 2017’ event at their Head Office on February 5, 2018. During the special ceremony, His Excellency Majid Saif Al Ghurair, Chairman of the Dubai Chamber, presented Al Nahda International FZCO with a certificate of recognition and an ‘Exporter of the Month’ trophy for demonstrating outstanding export performance for June 2017. “The awarded companies have worked hard to get where they are, and these firms serve as a source of inspiration for the rest of the business community. Each time we host this ceremony, we are impressed by the standards implemented by our members which are constantly improving, and ultimately enhancing the competitiveness of the private sector,” H.E. Al Ghurair said. H.E. 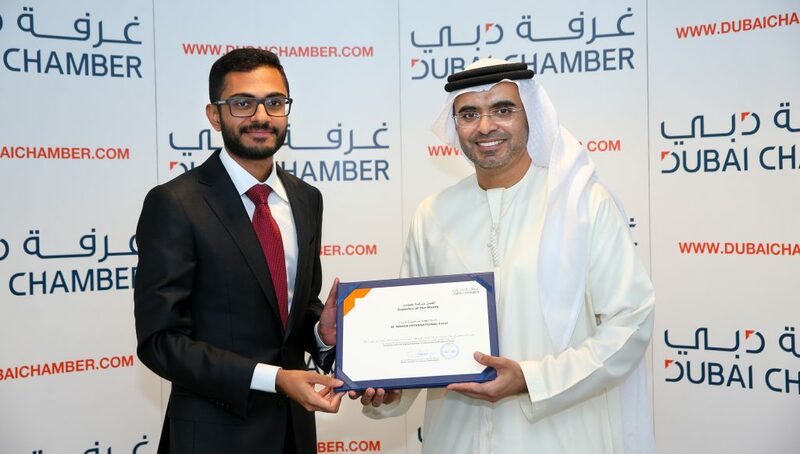 Al Ghurair noted that Exporter of the Month is among Dubai Chamber’s most important initiatives that recognises top-performing members, while it also aims to promote best practices within Dubai’s trade sector.